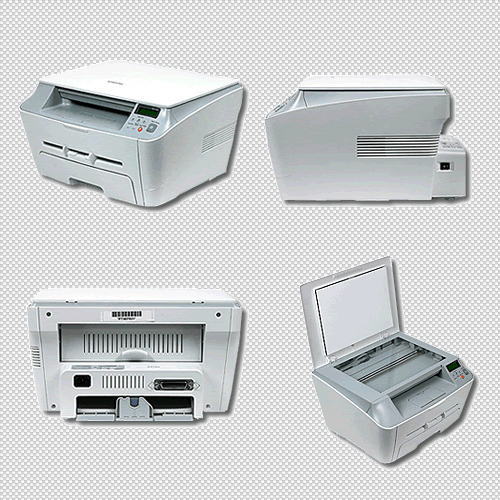 Samsung SCX 4100 is a multifunction device that combines a scanner and a printer, which in combination can be used as a copying device. To work with the scanner of this device is a special application Samsung SmarThru 4, which, together with the device driver is present on the optical disc in the package Samsung SCX 4100. Install the device driver and additional app Samsung SmarThru 4 if previously this was not done. To do this, use the optical disc from the kit you received with your device. If such a drive there, then download the driver and software from manufacturer's website. Make sure the device is turned on and connected to the computer via USB or LPT port. Open the cover above the scanner glass and add the scanned document, guided by the guide markers at the far left corner of the glass. Facial scanning) side should face to the glass. Close the lid as possible without leaving gaps. Run Samsung SmarThru 4, and then click on the icon marked "Scan". As a result, Windows programs additional pane will appear in which you have to choose one of the options for scanning. Using the tabs "App, you can scan the source and transmit the resulting image to any program. Using the tab "E-mail" scans and then send the image to the specified email address. In the tab "Folder" includes the commands of the scan is saved to your computer. Tab "Identification" involves the transfer of the result of scanning the program text recognition. Select the desired option. Set the desired values of chroma, resolution and the scanning area on the selected tab, and then click "Scan" and the app will start the process of reading the image. Use the TWAIN interface for scanning without using the Samsung SmarThru 4. Usually it is installed in the operating system by default. In this case, it is sufficient in any program (graphics editor, program, text recognition, image viewer, etc.) to choose Samsung SCX 4100 as the source of the document to open.